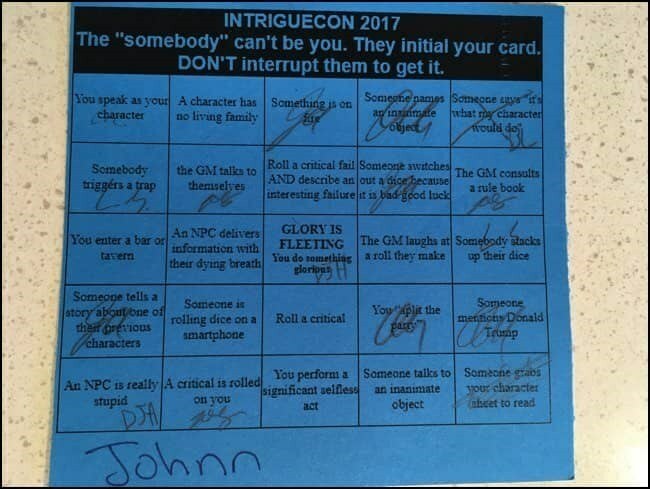 I played RPG Bingo at IntrigueCon. We were given bingo cards listing common convention and gaming clichés. Each time a gamer made a cliché you asked them to sign the box on your card. Claim your bingos between games for prizes. Some clichés were great, like GLORY IS FLEETING: You do something glorious. One soon realized they could set up situations for Bingo boxes to trigger. For example, I might have suggested the space bug and robot go investigate the alien ship while I piloted our ship to blast approaching asteroids, thus giving me You split the party. However, it also occurred to me RPG Bingo might make a great regular gaming tool! Rumours, gossip, and whispers on the wind. Place seeds and hooks for your adventures and encounters onto an RPG Bingo Card. You can be direct or subtle as your group style prefers. Each box represents something for the players to investigate so it becomes actionable. Meantime, players will pore over the card, musing on what each thing might mean and how they can go about getting more information. 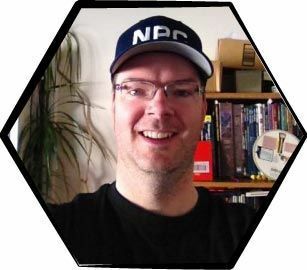 RPT readers wrote in last year asking how they could get their players to roleplay better. Boxes like GLORY IS FLEETING: You do something glorious and others you see on the IntrigueCon card are great examples of how you can encourage the gameplay you want. What if the boxes represented possible ingredients for spell research or magic item creation? Monster parts, special herbs, and rare minerals or objects. Get enough in a particular combination (bingo) to fulfill the requirements. When players get bingo they earn a reward. Rewards are another way to guide gameplay and get players involved. You might offer gold and magic. But you might also offer new contacts, critical secrets, and new information that unlocks more adventure. For example, create an RPG Bingo card with good deeds on it. Upon getting bingo — the PCs catching attention and proving themselves noteworthy — the party gets a visit from a paladin who offers a meet with the head of their order for possible support. You can make the bingo rewards anything you like. There are several creators online. Note that you can make your RPG Bingo cards small, regular sized, or large, based on how hard you want to make earning rewards. If you decide to try this fun little tool out, let me know how it goes!